I started this anime about last week but due to going on vacation I wasn’t able to finish it until yesterday. But here goes my review. 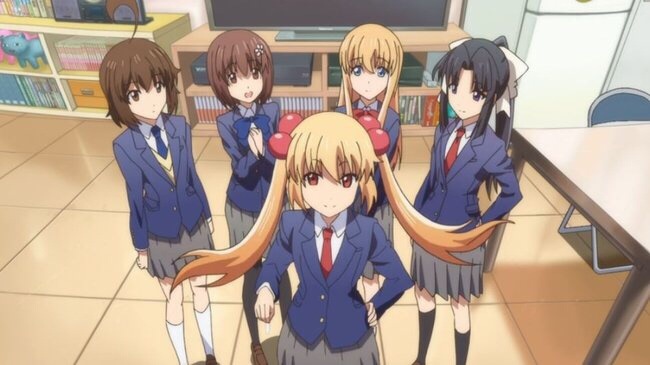 This anime is pretty much about a group of girls in high school who don’t join any specific clubs but one where they just get involved in different hijinks after school. They do have their very own club room which is where the scenes mostly take place. This anime is really funny and fairly short since it’s only 12 episodes and very similar to another anime that I enjoyed. This anime also has a few parodies so try to see how many you can find. I definitely caught the Dragonball z reference as well as a few others. This makes to anime fairly similar to the Student Council’s Discretion with the anime parodies, comedic humor, breaking the 4th wall, and how each episode is it’s own individual story just a bit. So definitely check out this anime if you haven’t already especially if you enjoyed Student Council’s Discretion. How do you guys feel about fanfiction? I for one really like to read it and would like to know if anyone would be interested in me posting reviews about the fanfiction that I read. It will be mostly anime fanfiction since that’s all I really read at the moment. But do you guys like to read fanfiction? Leave your comments below to let me know how you like or done like this idea. Also how do you feel about fanfiction in general. Not that long ago I happened to pick up at my local Walmart the newest Naruto Movie. Well the movie actually wasn’t bad at all. The 5th Naruto Movie is titled: Naruto Shippuden the movie Blood Prison. The movie is about how Naruto is framed for a crime he didn’t commit and is sent to an inescapable prison named Hozuki Castle. Of course once Naruto gets there he causes a lot of ruckus. Overall this movie was good and I enjoyed all the action and seeing all of our favorite characters again, but this definitely wasn’t my favorite Naruto movie. The art in the movie was great and I enjoyed it and the music in the movie also fit the show. One other great thing that I liked about the movie was that you got to see killer bee which was awesome! But my favorite thing about this movie is that if you have the DVD then there is short where Naruto goes against Konohamaru in the Chunin Exam. That was super funny and had me laughing from beginning to end and I’m not going to tell you how it ends but it was awesome! So if your a fan of Naruto definitely don’t miss out on the newest film. So happy watching! Now I had heard of this series a while back but it wasn’t something I really wanted to watch at the time. I finally decided to watch it when I was on YouTube and heard one of the English voice actors or voices the main character in the series talk about. That is when I because intrigued into what this show was about and decided to watch it once I had the time. Steins Gate is about a group of individuals who find out that they are able to send text messages into the past to change the present due to a super microwave. The show starts off with a funny feel definitely due to the main character the scientist Okabe who is arrogant and thinks he’s better than everyone. In a weird way he kind of reminds me of Brain from Pinky and the Brain. But anyway Okabe realizes that every time they send a message that he gets sent to a parallel time where the message sent has came true but he is the only one who remembers what the past was and what has changed. Later on though Okabe starts to see what changing the past can do and sees the consequences that can happen. That’s where the darker element of this show comes into play. In one scene in the latter half of the series you see Okabe lose his mind due to him trying to save the life of one of his dearest friends which all of a sudden makes him real and no longer the arrogant character that he was before. No you know me and I love romance so of course this anime has a little but of romance and even a kissing scene (yay!). But overall this series was perfect to watch and had me from the beginning to the end. So if you like time travel and drama plus even some violence and romance then Steins Gate is a great show to watch. Well like I promised here is the anime review for today! So the anime I’m reviewing is called Anohana. I had been wanting to watching this anime for awhile now because it looked interesting but I heard it was sad and I didn’t want to cry. But when I had a day off and wanted to watch a short anime Anohana (it’s 11 episodes) was what I decided to give a chance in watching. When I finished this series I was very happy that I gave it a try. Anohana is about a group of kids now teenagers who have gone their separate ways after the death of one of their friends. Now years later Jinta also known as Jintan is able to see the ghost of Menma. Now Menma is aware that she is dead but she remembers that she had one last request. Now through out the series you see how the group starts to come back together but you also see how each of them have to face the feelings of what happened that day when Menma died and the feelings of what happened after. Now this series wasn’t all sadness because it did have a few funny moments too, but the tears definitely did fall. I started crying after the first episode so that says something. This series also has romance as well with quite a few love triangles going on in the series with a few broken hearts happening as well. The music in this show is also amazing! I absolutely fell in love with the ending song “Secret Base ~Kimi ga Kurera Mono. I have this song in my playlist and a piano version as well since this song was so good and definitely fit the entire feel of the show. Now if you enjoyed shows like Angel Beats or Clannad/Clannad After Story then you will definitely enjoy Anohana. Just be sure to bring a few tissues with you as your watching it. There is also a movie that acts as epilogue after the series which I haven’t watched yet but I heard it’s good so I plan to watch it soon. So check out Anohana and thanks for reading my review! Hey everyone I’m sorry for not posting but I’ve been busy with work and well life. But I’ve been watching lots of anime and will be posting one of my reviews tomorrow. So be watching out for it.